Chemists have been building molecular models for centuries. It’s a crucial exercise in understanding the interactions that take place and are otherwise invisible. But there’s no denying drawing structures or fiddling with Molymod lacks the excitement and spectacle of a live experiment. Now, this traditionally dull activity could be about to get a new lease of life, thanks to advances in a technology more often associated with gaming: virtual reality (VR). In David Glowacki’s lab at the university of Bristol, UK, molecules appear right in front of you in all their moving, three-dimensional glory. You can push, prod and even wrestle with them. Glowacki has spent five years perfecting the Nano Simbox VR system, which gives those who don Occulus Rift-style headsets an experience of total immersion in the molecular world. Armed with ‘atomic tweezers’ one can attempt to tie a wriggling peptide chain into a knot, or manipulate a drug molecule so that it docks with the active site of a receptor (see films below). Glowacki decided to create Nano Simbox after he developed an interest in different ways of presenting scientific data. An earlier project, the science meets art installation Danceroom Spectroscopy, allowed visitors to manipulate a simulated atomic world by capturing their movement with 3D cameras and incorporating it into force field calculations. A few years on, he has taken the concept further. The potential of VR extends far beyond impressing undergraduates. Glowacki has high hopes it will be useful as a research tool. His own group is using the Nano Simbox to simulate the scattering of reactive molecules on surfaces. And he is conducting trials of the technology with several UK-based pharma companies to explore its potential in that arena. Glowacki’s enthusiasm for this ‘new kind of chemical intuition’ is shared by Markus Reiher of ETH Zurich in Switzerland. He has been collaborating with Glowacki to combine VR with his own work on ‘haptic chemistry’, a set of tools that he has been developing for several years that allows investigators to actually ‘feel’ the forces simulated atoms and molecules are experiencing. Reiher’s setup is essentially a computerised model fed by rapid, almost real-time quantum mechanical calculations that Reiher and his group have spent years developing. The software translates values representing the energy of a structure into a force that can be felt by the user via a handheld pen device. His group soon hope to release a version of their system which is free for other researchers to use, and they have also explored the possibility of combining it with Glowacki’s VR. ‘I visited him earlier this year and we hooked his virtual reality up to our quantum mechanical model,’ Reiher says. ‘Before, he had a system where he could do manipulations of molecules mostly based on classical force fields, but he couldn’t do any reactions because you need to have a sufficiently reliable quantum description the moment you break bonds. So we tried it with our implementation and it worked right away.’ He adds that, having tried the system, the immersive experience is ‘extremely convincing’. Glowacki even believes that the visual wow factor of VR could help to address some of what he calls chemistry’s ‘PR problems’ – a perception among the general public that it is boring and lacks visual appeal. His spin-out – Interactive Scientific – has already attracted investment to develop Nano Simbox as an educational tool. ‘The ambitions for it are big and potentially transformative in terms of how the general public think about chemistry,’ says Glowacki. ‘The aim of the company is to put this in every high school in the world.’ Glowacki and his colleagues are now working to make it as cheap and easy as possible, with the hope that it can be adopted widely. Interactive Scientific is not the only company who hope that the current trend for VR in the gaming world can transform science education. 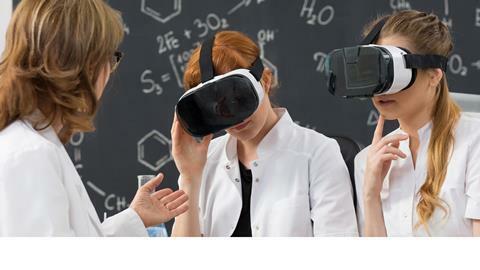 The founder of chemistry set subscription service MEL Science, Vassili Philippov, tells Chemistry World the company has begun to offer VR-based resources this year, offering more than 150 curriculum-aligned lessons for use by schools. ‘You can play with molecules, you can see enzymes making proteins based on RNA right in front of you. You can play and interact with them, so they’re real for you and it’s easy to understand what’s actually happening there. That’s probably the biggest value of virtual reality – to see the invisible,’ he says. Their technology is designed for platform Google Daydream and a version for the even cheaper Google Cardboard is in the works. Like Glowacki, Philippov envisions VR playing an increasingly important role in classrooms in the future. But could VR take over the role of practical work entirely? In our 2016 science fiction feature Testing times, writer John Gilbey envisions a world where learning is entirely virtual. It’s not too difficult to imagine a future where students don a headset and sensors in place of a lab coat and goggles, and are transported into a world free from the risks of burns and spillages. But Philippov is among those who feel this would cross a line. Computational chemistry: a virtual reality? Computers are getting better at modelling chemistry. But there are still many challenges to overcome.